The South Dakota Lease Termination Letter is a legal document. 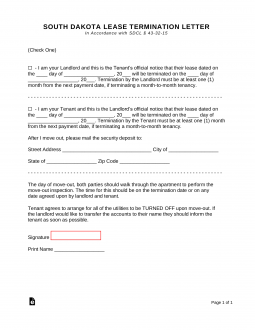 This document is one that is required by most all owners/landlords/management companies in order to provide the appropriate days of notice to vacate the premises which is fifteen (15) days when letters are being sent to the landlord and thirty (30) days when being sent to the tenant. It may be used by either the landlord or the tenant. It’s very simple to complete and will serve the need to provide legal notice to vacate, one to the other. Once notice has been served it allows anyone to remain in compliance of a rental agreement.